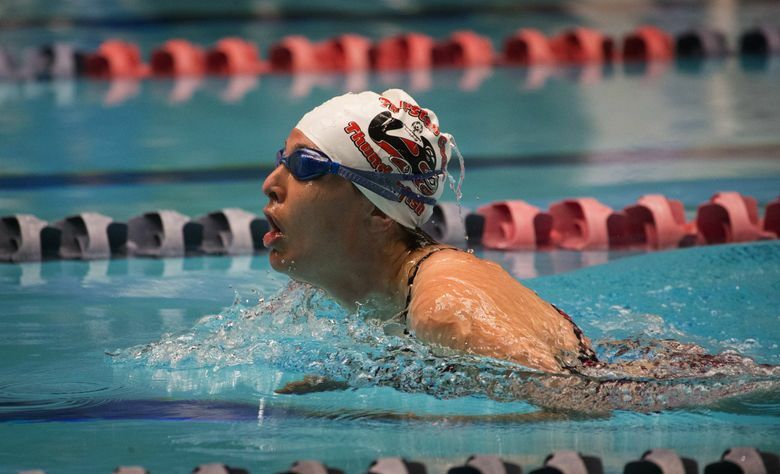 Robertson won her second gold medal of the Special Olympics USA Games, this one in the top division of the female 25-meter breaststroke, by nearly 10 seconds. Her time — 23.47 seconds — was easily the best time among all divisions. FEDERAL WAY — Another breaststroke race, and another gold medal for Emilie Robertson. Robertson, 32, from Lacey, had one of the most dominant performances in Friday’s final day of swimming in the Special Olympics USA Games at the King County Aquatic Center. Robertson won the top division of the female 25-meter breaststroke by nearly 10 seconds in a time of 23.47 seconds, which was easily the best time among all divisions. On Monday, Robertson won a gold in the second-to-the-top division of the 50-meter breaststroke, and had the second-best time overall. Robertson had little time to celebrate her win in the 25-meter breaststroke as a few minutes later she was swimming the third leg for Team Washington in the 400-meter relay. She swam a good leg, but her team was fourth. But there was nothing but smiles from Robertson, who said this was her first experience in a national competition. You might have thought Team Kentucky swim coach Debbie Ogden had hit the lottery based upon her celebration. She looked up at the scoreboard and discovered that her swimmers, Justin Hale and Hunter Eudy, had finished second and third in the 50-meter backstroke in male Division 6 after a great three-way battle with Southern California’s Steven Espinoza for the second, third and fourth spots. It was too close to predict, so when Ogden saw that her swimmers were second and third, it started a spontaneous celebration of jumping up and down, clapping and yelling. It was the type of celebration seen so often at these games. “I was just so happy for them, because they had worked so hard, and Hunter had come so close to making the podium before but he hadn’t,” she said. That changed Friday, as he will be taking a bronze medal back to Kentucky. Practice? Team Ohio didn’t need much volleyball practice to win a gold medal Friday at the University of Washington’s Intramural Activities facility. Ohio merged three of its Columbus-area unified men’s teams together and practiced three times before traveling to Seattle for the week-long tournament. Forming a conglomerate is part of the way the state selects its teams to represent Ohio at nationals. Coach Chris Guzzo credited familiarity between the athletes and partners during regular-season competition for the ability of the 12-member all-star roster to play fluidly. Team Ohio defeated Team Arizona in three sets (25-22, 14-25, 15-10) for the championship before a capacity crowd on the main court. Perhaps the two most tired people at the end of swimming Friday were Alex McNeil from Arizona and Noah Infante from Rhode Island. They were the only two entered in the very demanding 800-meter freestyle. Both were strong until the end, with each getting big and deserved ovations at the end.